Get full step coverage with the Extreme Wheel-to-Wheel Side Steps from Black Horse Off Road. 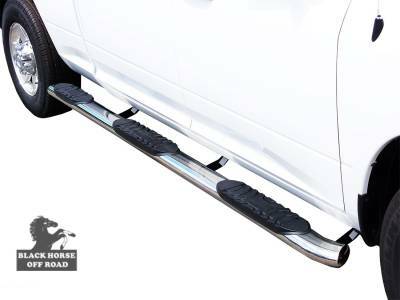 These 5-inch steps offer style and function to your vehicle and are made with heavy duty steel to last you a very, very long time. Get yours today! Black Horse Products in polished finish and in black powder finish are covered by a limited lifetime warranty and a 3-Year warranty, respectively, to be free from defects in material and workmanship from the date of purchase. This warranty does not apply to any Products that have been subjected to misuse, mishandling, misapplication, neglect (including but not limited to improper maintenance), improper installation, or alterations. Add a perfect finishing touch to your vehicle with Black Horse Off Road accessories!